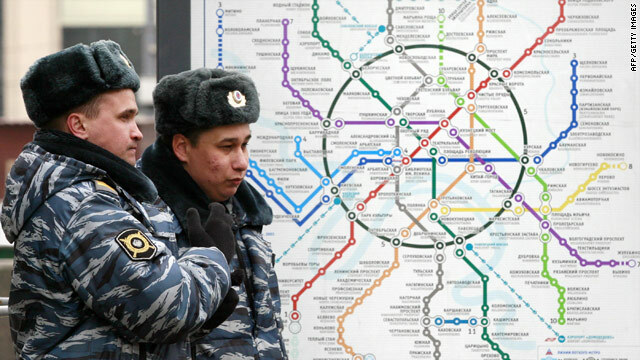 Russian police stand next to a map of Moscow's subway system. (CNN) -- The deadly rush hour carnage which hit Moscow's subway on Monday highlights a potential danger that millions of people around the world are exposed to on a daily basis as they enter transport networks, say security experts. Suicide bombers have been blamed for the bombings at two stations on the same underground rail line, with separatists from Russia's Chechnya region, linked to previous transport system attacks, claiming responsibility. 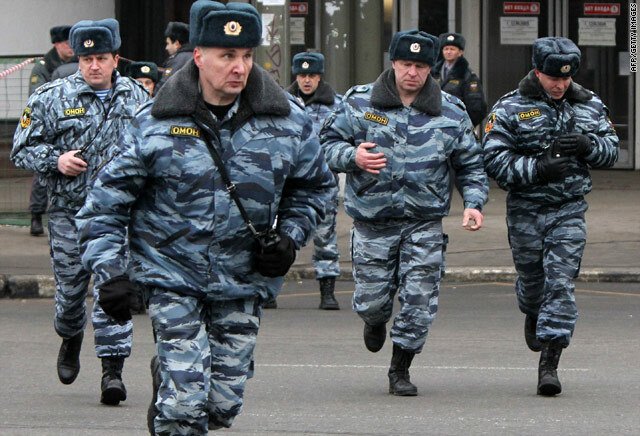 While authorities say it is too early to confirm who is behind the latest outrage to target Moscow, it matches a modus operandi previously employed not only by Chechen rebels, but other groups worldwide, usually to potent deadly effect. 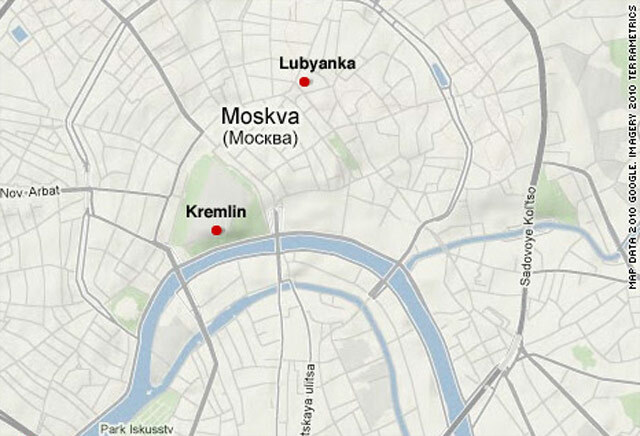 Resonance from the attacks was immediately felt in other urban centers, with New York police announcing a hike in security levels on the city's subway system in direct response to the events in Moscow. But say experts, while many heightened security measures are in place on metro systems in major cities, little can be done to prevent future attacks without disrupting the infrastructures of the world's urban powerhouses. Even as Russian authorities beefed up security on their already well-monitored transport network, officials conceded they would be powerless to halt determined suicide attackers from committing further atrocities. "The subway is a vulnerable system, you can never protect it 100 percent," Konstantin Kosachev, internal affairs committee chairman of the Russian State Duma, told CNN. "It is absolutely unpredictable." The fact no watertight security solutions have been developed in the wake of numerous attacks highlights the dangers that continue to hang over transport networks -- risks only exacerbated by their claustrophobic confines. Testament to this are a deadly 1995 Sarin gas attack on the Tokyo subway, a 2003 arson incident that killed 120 at a subway station in Daegu, South Korea, a February 2004 bombing on Moscow's underground which left 42 dead and London's July 7, 2005 al Qaeda-linked attacks in which 52 people perished. "Subway attacks are ideal for a terrorist," Will Geddes, CEO of International Corporate Protection, told CNN. "They are bringing the whole city to a halt and they not only create the disruption on that particular day but they create a greater residue of fear, which is their main aim. "There are people in London who are still hesitant of traveling on the Underground because of the July 7 attacks, and for the terrorists that's a winning objective: They are getting their message across and causing disruption," Geddes added. London's Underground network, which carries more than three million commuters daily, is no stranger to anti-terror measures, with decades of vigilance against potential strikes by Northern Irish separatists prompting the introduction of basic measures such as transparent trash cans. Further efforts have been made in the wake of July 7 bombings, with hundreds more security cameras being added to the city's world-beating closed-circuit surveillance network -- and more expected ahead of the 2012 Olympics. But any plans to impose airport-style screening that could detect explosives or even detect metal are unlikely to be introduced on the world's busiest mass transit networks because cost and disruption make them unviable. Says Geddes, such insurmountable practicalities mean that future attacks can be expected, not just in Moscow but in cities across the world. "It would be virtually impossible to implement something like that on a metro system. Suicide bombers can turn up on the day and act spontaneously and to implement the security measures needed to guard against that would be prohibitively expensive. "The larger the network, the larger the cost -- and any attempt to impose such measures is going to cause major chaos and major delays and render any subway network ineffective."